Do you enjoy peace, nature and culture? 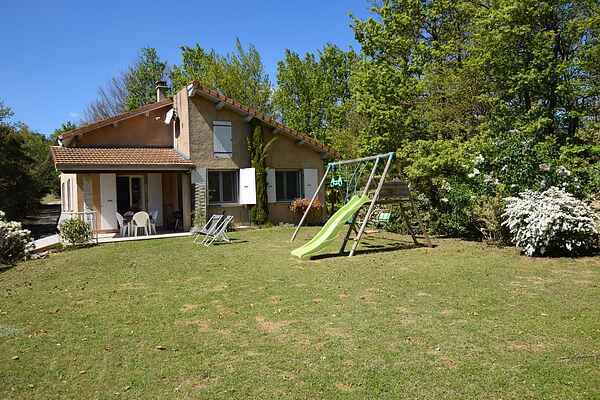 It's all here for you to enjoy in this lovely holiday home in the splendid region of Drôme Collines. This pleasant house has a fantastic garden, with a ping pong table and swings for the children. They can enjoy themselves while you savour the beautiful view and a good glass of wine. The living room has a beautiful fire place. Under the house is an apartment (out of view) where the brother of the owner lives. The surroundings are easily explored on foot or bicycle. It is truly magnificent here. You can of course choose to take the car. Then why not drive to and admire the unusual Palais Idéal du Facteur Cheval (12 km). This palace was built by a local post man, over the years he collected the stones whilst on his rounds. The Labyrinthes de Hauterives is a maze full of lavender fields and romantic pathways. In Romans-sur-Isère (20 km) there is a nice shoe museum. A little further away is the old university town of Valence (35 km). For the children a visit to the bird park in Upie (51 km) is highly recommended.